Carly Telford saved a late penalty to ensure Notts County Ladies shared the spoils with Birmingham City at Solihull Moors. 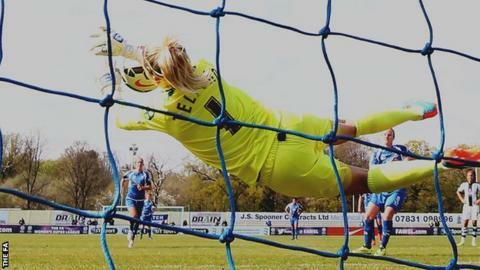 The England stopper denied Remi Allen from the spot after the Birmingham midfielder was brought down in the box. The hosts failed to threaten before the penalty, while Blues keeper Rebecca Spencer had to deal with tame efforts from Ellen White and Alex Greenwood. Both sides remain without a win in Women's Super League One this season. The visitors were dealt a blow in the second half when England defender Greenwood had to be helped off the field with an apparent knee injury. While Notts are yet to learn the extend of Greenwood's problem, the Lady Magpies seem close to welcoming back fellow England defender Sophie Bradley after nine months on the sidelines. Bradley, 24, took a major step forward in her recovery from a knee injury when she was named on the bench, but did not feature in the game. "The big thing today was that we lost two on the bounce and in no way could we lose three on the bounce - it is unheard of from this football club in this league in recent years. "We had to stop the rot. We will take the point and clean sheet - it is something to build on. "Today was about not losing - that was a big, big thing. The same really went for both teams as we both only had one point from two games to start the season." "It was really important in that second half to keep a clean sheet. Our back four in that second half were tremendous. "The problem was ourselves as we kept giving the ball away too easily. I'm pleased with the performance and clean sheet, it shows we have tremendous work ethic, we just need to be a bit more impressive with the ball." Birmingham City Ladies: Spencer, Sargeant, Carter, Mannion, Harrop, Allen, Potter, Lawley, Westwood, Windell (Simpkins 49), Haines. Substitutes not used: Baggaley, Wellings, Stringer, Torkildsen. Notts County Ladies: Telford, Walton, Turner, Bassett, Greenwood (F Whelan 58), Susi, A Whelan (Clarke 53), Buet, Crichton, White, Williams (O'Sullivan 53). Substitutes not used: Draycott, F. Whelan, O'Neill, Bradley.